Why doesn't the text update when I change the font properties in Grapher? This article contains information about how to change text or font properties for characters in the Text Editor in Grapher. In Grapher, text is edited in the Text Editor dialog. This dialog allows each character to have its own format. To change the properties of text, highlight the text in the Text Editor. Make any changes to the font properties and the properties are applied to only the selected text. 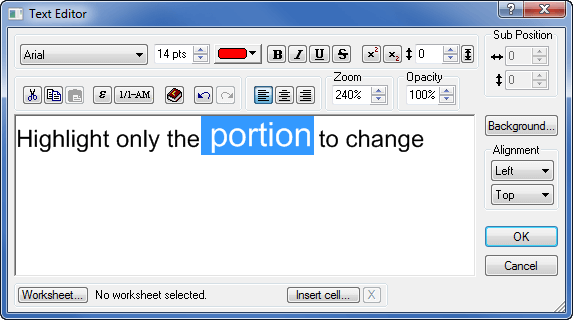 Click OK.
To change only a portion of the text, select only that portion in the Text Editor dialog. Make any changes and click OK. Only the selected portion of the text will change. Highlight only the selected portion of the text to edit. How can I edit my Surfer grid?